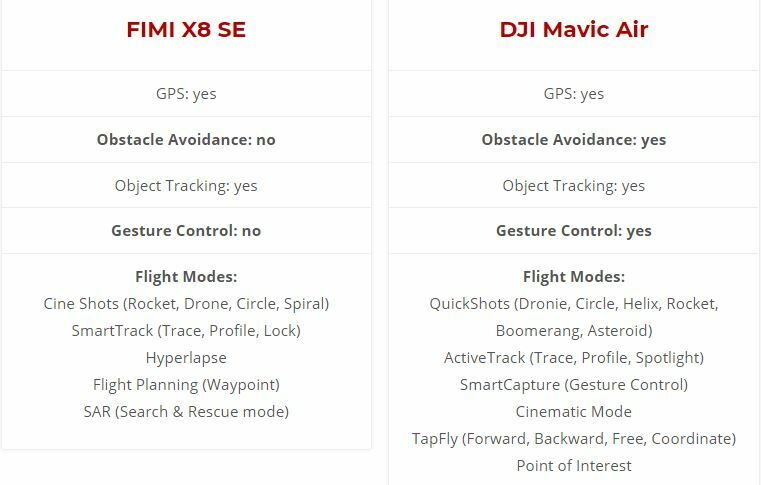 In the Xiaomi FIMI X8 SE vs DJI Mavic Air, we will go through all the important aspects of each drone. At the end of the article, you will have all of your questions answered. Well, at least you should have most of your questions answered. While is still relevant new, the FIMI X8 SE drone appears to be working exceptionally well just like Xiaomi said. 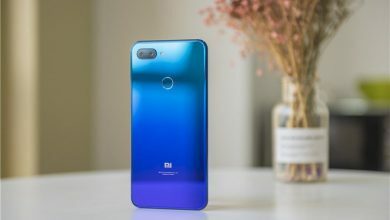 Without further ado, let’s dive into Xiaomi FIMI X8 SE vs DJI Mavic Air comparison guide. 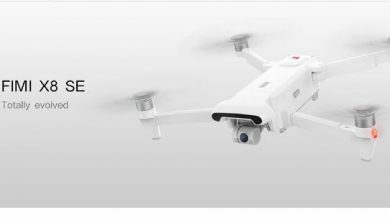 As mentioned FIMI X8 drone is larger and heavier than DJI Mavic Air. This benefits max. flight time which is 12 min. longer for FIMI X8, or on other words more than 50% longer than Mavic Air! The other specs seem to be comparable, about the same distance and speed. This of course is influenced by weather conditions and surroundings (distance). Here’s a frame grab of a video recorded in 4K with 30fps by Sami Luo. The video is embedded at the end of this article. There is a minor difference when looking at the lens specifications. DJI Mavic Air offers a bit wider FOV with 85° while FIMI X8 SE is a bit narrower at 78.8°. Light sensitivity is better with FIMI X8 as aperture is f/2.2 while Mavic Air offers f/2.8. So FIMI should perform a bit better in low light situations but therefore requires faster shutter in bright sunlight. Let’s see if there will be ND filters available for FIMI X8 SE to better cope with that. 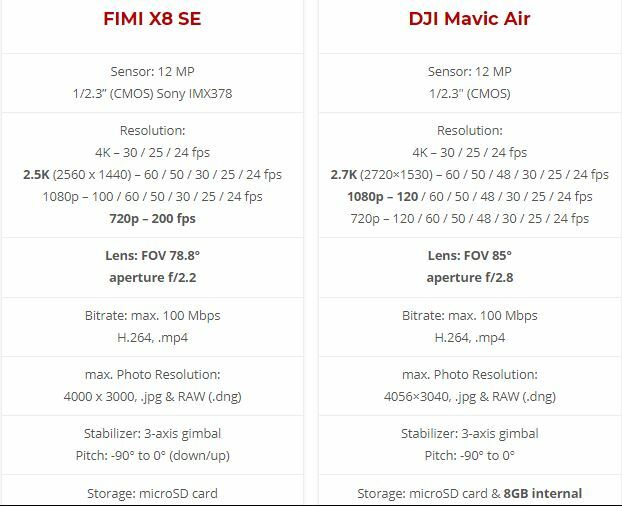 In terms of camera specs FIMI X8 SE and Mavic Air seem pretty comparable. Both offer a 12 MP, 1/2.3? CMOS sensor and therefore 12 MP photos in .jpg or .dng (RAW) format. Both drones are capable of 4K video recording with 100 Mbps. 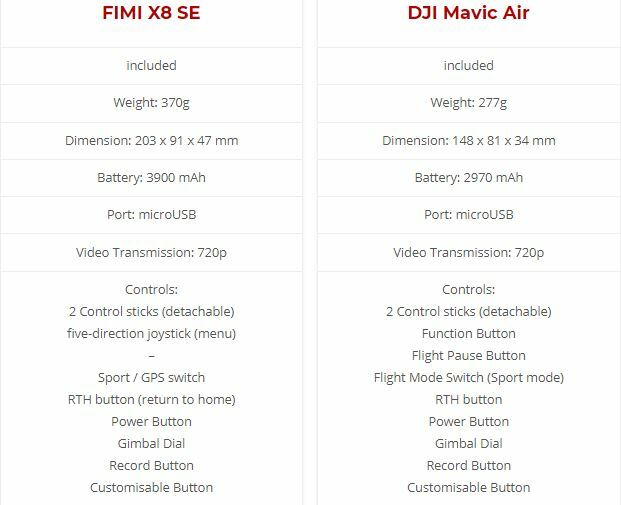 There are some minor differences in lower resolutions: While DJI Mavic Air offers 2.7k resolution, FIMI X8 SE offers 2.5k resolution. The available frame rates in these resolution settings are the same. 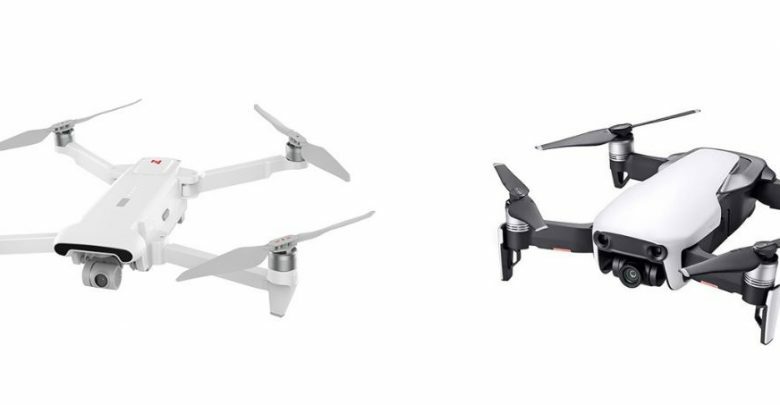 FIMI X8 SE offers up to 100 fps in 1080p while DJI Mavic Air offers 120 fps on the other hand in 720p X8 offers a higher frame rate with 200 fps. Another notable difference: 8GB of internal storage are available on Mavic Air. I really like that feature as you can do some more shots when your SD card is full and battery lasts to keep on flying. Or in case you forgot to insert your microSD card before take off. Since I couldn’t test FIMI X8SE myself right now and there is no manual available, I’m not quite sure about the remote buttons and functions. A visible difference is the way your smartphone is mounted. While you clamp it into brackets below the controller on DJI’s controller, it clamps right in the middle of the FIMI remote. This way the FIMI remote can better handle larger devices such as tablets. The built-in battery is charged via micro-USB cable. I’m not a big fan of that since the drone is using a USB-C cable – so you need to carry both of them or an adapter. Speaking of batteries, similar to the drone, FIMI offers a larger battery and therefore the device is heavier. A big plus of DJI Mavic Air is definitely obstacle avoidance. Mavic Air got sensors facing forwards, backward and downwards to help you preventing crashes. This is especially useful when using active track or a predefined Quickshot/Cineshot and you are focusing a bit more on an activity rather than the drone. Active Track is available on both drones in similar modes (trace, profile,…). DJI Mavic Air offers a few more Quickshots than FIMI X8 offers CineShots, but still very similar performance. Great addition on FIMI X8 is the hyper-lapse mode. DJI introduced it with Mavic 2 but doesn’t offer an update for Mavic Air so far. Also, the Waypoint mode seems very interesting on the graphics, but I need to test that first to give more insights. 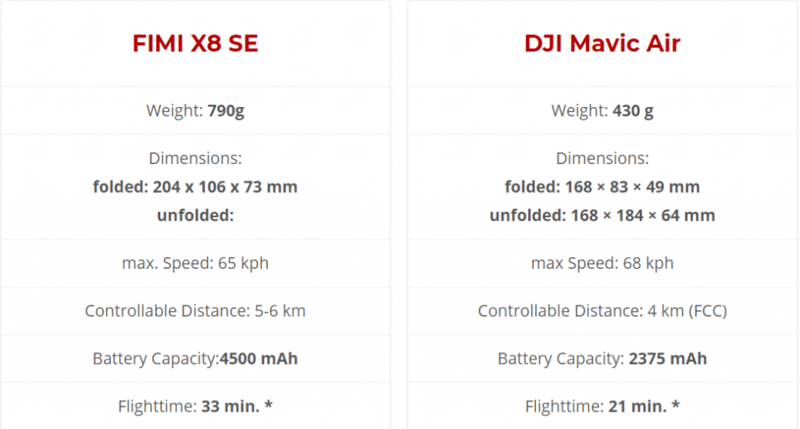 Perhaps you will be surprised by the difference between the Mavic Air and FIMI X8 SE drone is their flight time. As you know that measuring the real flight time isn’t an easy thing due to many factors that will impact how long you can realistically fly them. The Mavic Air drone has a flight time of 21 minutes, realistically, you will be able to fly it around for 18 minutes accounting smart return to home and other safe flight measures.